With a very heavy heart that I write this email. The restaurant was named after me as a little girl and I literally grew up in those four walls. Seeing it Wednesday morning was horrifying. The restaurant was much more than a restaurant. It was that place that put food on the table and gave me an education and made me part of a family that was bigger than I could ever imagine. Your kind words and gestures of the past few days mean more to us than you will ever know. Our immediate concern is making sure our amazing staff is taken care of. 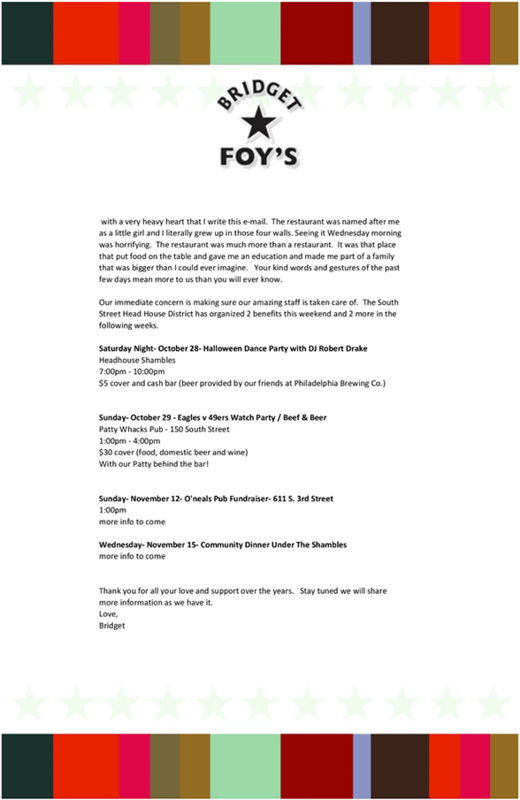 The South Street Head House District has organized 2 benefits this weekend and 2 more in the following weeks. Patty Whacks Pub – 150 South St.
Sunday – November 12th – O’neals Pub Fundraiser – 611 S. 3rd St. Thank you for all your love and support over the years. Stay tuned we will share more information as we have it.